Circus Chairman Kevin Sweeney said this is the first year the entire circus will take place in a tent, as opposed to an arena. In the past, the circus has been held at the Montgomery County Fairgrounds, Hara Arena and University of Dayton Arena. This year’s event will be the Antioch Shriners’ 77th circus in the Dayton area and their second year partnering with The Tarzan Zerbini Circus. 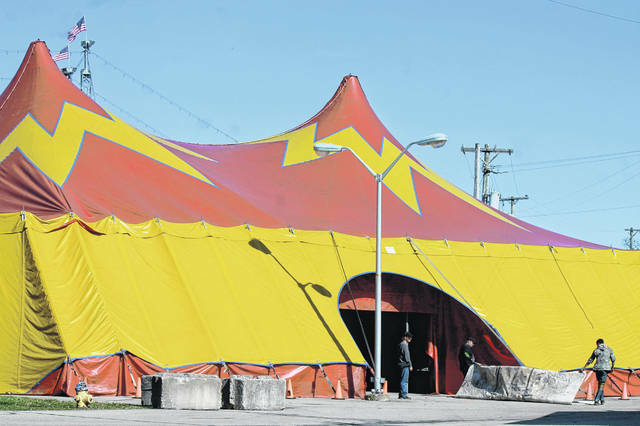 https://www.xeniagazette.com/wp-content/uploads/sites/32/2019/04/web1_Tent.jpgAnna Bolton | Greene County News Crew members work to set up the Antioch Shrine Circus tent April 2 at the Greene County Fairgrounds. Shows will be held Thursday-Sunday, April 4-7.